Surya Grahan 2017 is the long awaited total solar eclipse that will be seen over the center of the United States on August 21 between 10 PM IST to 1:30 AM IST . The American continents are getting ready to observe this rare celestial event. The famous diamond ring that only forms when the moon totally covers the sun is a once-in-a-century occurrence for any geographical location, owing to the angle with which the lunar orbit is tilted with the orbit of the Earth around the Sun. While the common people are excited to view this beautiful event, astronomers, and educators, in general, warn that certain precautions are necessary if you want a safe experience. When we look at the Sun directly, our eyes hurt and the pupil closes up to prevent a dose of radiation that might cause the retina to burn. While this natural response prevents us from being blinded when we go out in the sunlight, eclipses are a little different. When the moon blocks the radiation from the Sun directly, our eyes relax a little too much and that leaves our eyes vulnerable. The burning from the excessive radiation causes a kind of macular degeneration and they can lose vision and it can be permanent. All the while, you may not even feel uncomfortable as you stare at the Sun. To avoid this and view the eclipse safely, you would need glasses that have a special filter that blocks out most of the radiation from the sun. Regular sunglasses are useless here, and only eclipse glasses that have a certification with “ISO 12312-2 international standard” are safe for use. You can also use number 14 welder’s glass, and you may have also seen the pinhole projector that lets you project the image of the Sun and the moon’s shadow onto a screen. The pinhole projector is actually a great way to track the progress of the eclipse. 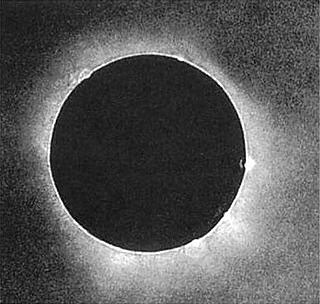 However, there is one important exception to the rule of not staring at the Sun directly during an eclipse : for the short duration when the moon covers the Sun along the path of totality, you may take off your glasses and look at the Sun directly without fear of blinding yourself.